Queen Elizabeth I was born on September 7, 1533, in Greenwich England to Henry VIII and his second wife Anne Boleyn. Elizabeth’s early life was full of uncertainty. She was third in line to the British throne after her half-sister Mary and her younger brother, Edward. Because Elizabeth was born to King Henry’s second wife, most of Europe, which at the time was devoutly Catholic, considered her an illegitimate child and not fit to rule the nation. Growing up Elizabeth showed an enormous intellectual aptitude and became renowned as an influential young mind. Even though religion was a decisive topic in Europe, Elizabeth and her brother Edward were raised during the most formative years of Protestantism, this would influence her throughout her life. 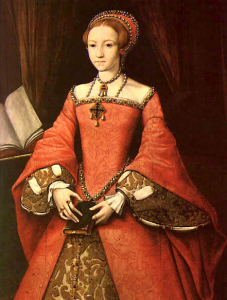 She became Queen in 1558 at the age of 25 after the death of her half sister Mary. In the mid to late sixteenth century, there was a deep Catholic/Protestant divide in England. While her sister Mary was a Catholic and ruled as such, Elizabeth was a Protestant and attempted to convert her entire country. This unheard of policy resulted in her excommunication from the Catholic Church in 1570. Despite her harsh reputation as a shrewd Queen, Elizabeth was immensely popular among the British people and her reign is referred to as the “Golden Age of Elizabeth”, which ushered in a new area of prosperity for England.On the day she ascended to the throne, Elizabeth made her Protestant faith clear, bringing England back into the Reformation after a period of enforced Catholicism. Under Elizabeth’s rule, literature flourished thanks to Shakespeare, Marlowe, and Spenser. England laid the foundations for its future empire through the explorations of Sir Walter Raleigh, and Francis Drake on the American continents. Queen Elizabeth died March 24, 1603, ending the Tudor reign in England. Elizabeth also died having never married, despite multiple suitors she died the “Virgin Queen”. Ciara.Berry. “Elizabeth I (r.1558-1603).” The Royal Family. March 11, 2016. Accessed September 26, 2017. https://www.royal.uk/elizabeth-i-r1558-1603. “Queen Elizabeth I.” History TV. May 12, 2017. Accessed September 26, 2017. http://www.history.co.uk/biographies/queen-elizabeth-i. Greenblatt, Stephen J. “Elizabeth I.” Encyclopædia Britannica. August 31, 2017. Accessed October 02, 2017. https://www.britannica.com/biography/Elizabeth-I. Reformation Europe is powered by WordPress at Duke WordPress Sites. Please read the Duke Wordpress Policies. Contact the Duke WordPress team.